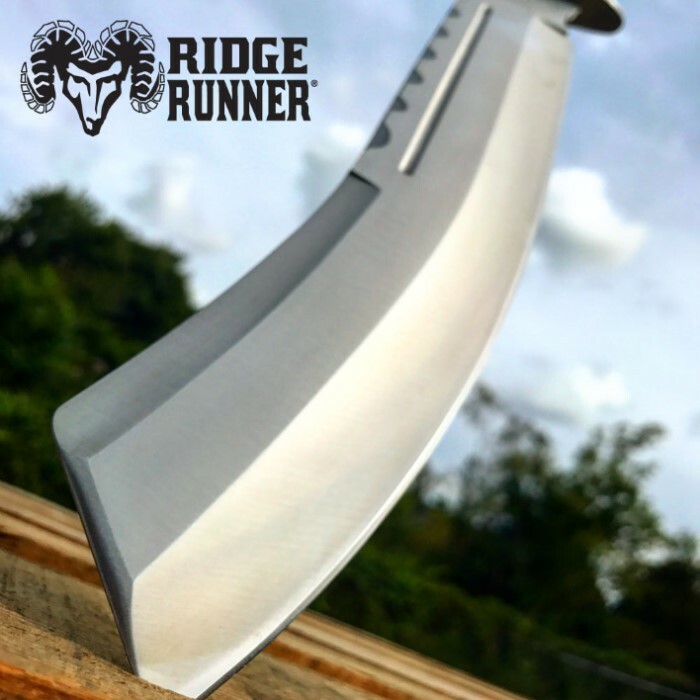 Big, bad and delightfully savage, Ridge Runner's colossal "Brimstone Canyon" Machete is a bladed predator with an insatiable appetite for demanding, rigorous field work. Its mammoth, extra robust 12" blade is forged from tough stainless steel, delicately arched for extreme chopping power. The hefty blade makes quick work of even the most challenging jobs - hacking stout limbs, slashing fibrous plant stalks and chopping kindling. 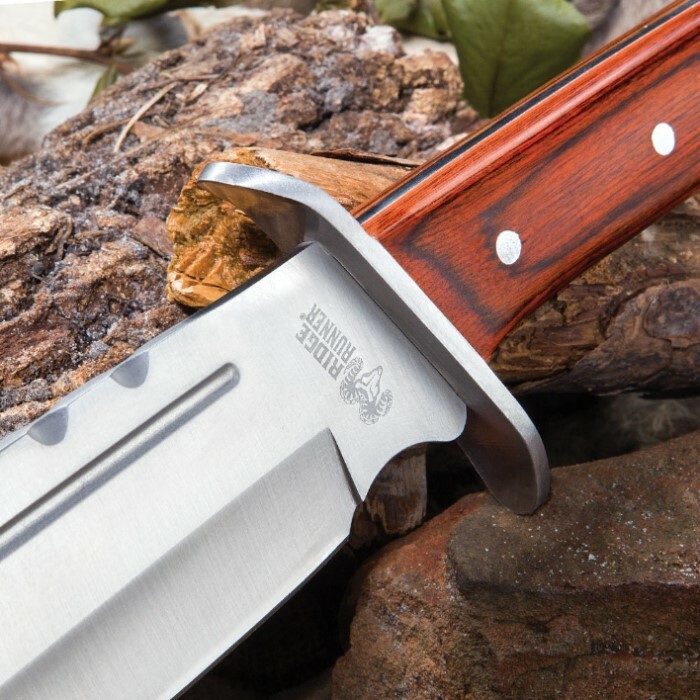 But the "Brimstone Canyon" isn't all serious business; handsome scalloping and sleek beveling along the blade spine add a charming touch of grace, and the rugged pakkawood handle showcases elegant grain and a rich mahogany hue. Brilliant, mirror polished stainless steel guard and pommel beautifully offset the tastefully mellow allure of the pakkawood, while providing added stability and hand protection. Despite its impressive size, the Brimstone Canyon is easy to transport, thanks to the included heavy duty nylon belt sheath. 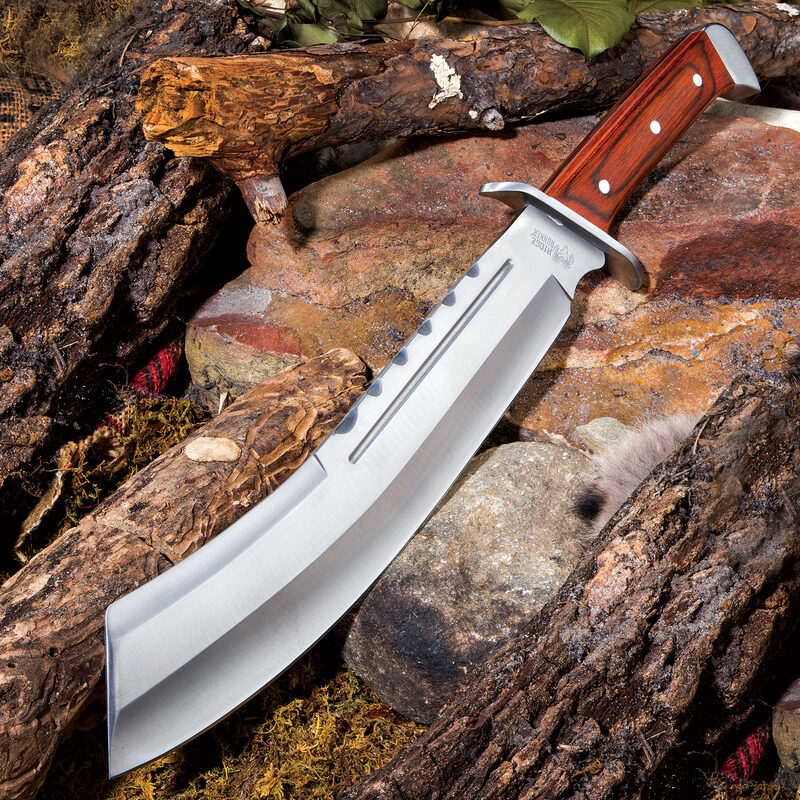 The sheath, along with proper use and care, helps ensure your Ridge Runner Brimstone Canyon Machete is poised and ready for action for years and even decades to come! I'd call it more of a parang than a machete since it's more of a chopper than a cutter. But whatever you call it, it is a well-fitted, full tang, substantial blade perfect for the outdoorsman and survivalist. 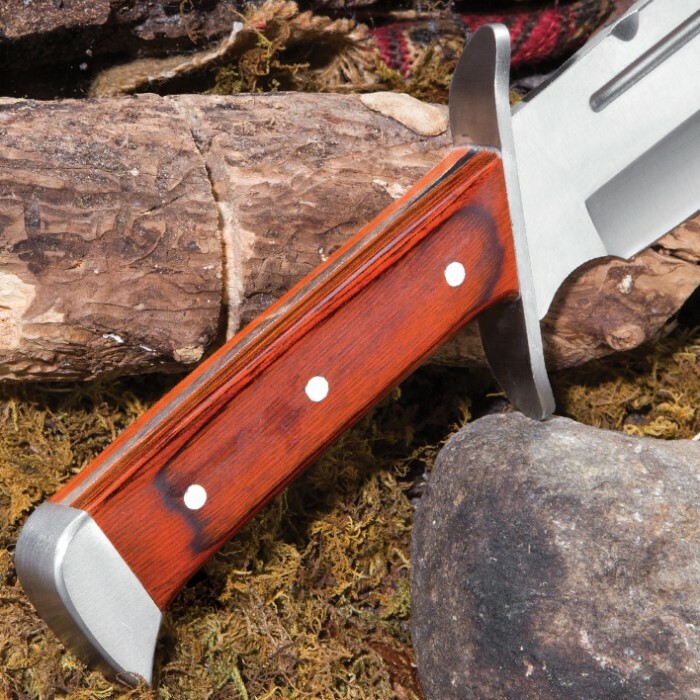 By the way, the Ridge Runner Renegade Bowie is an excellent companion piece. They have the same wood grain pakkawood handles and the same pommel. I only wish they each had leather sheaths instead of nylon, but at these prices, I won't complain. I highly recommend each of these products. Great blade, hefty. Nice weight and great price. Heavy Duty, excellent craftsmanship and Great price!! !Get the matching Bowie!!!! I was amazed with the weight and sturdiness of this blade. Not a junk flea market buy! You get more than what you pay for in my opinion. I was really surprised at the hardiness of this machete. It is quite good-looking, but at the same time very strong and exceptionally heavy-duty.. It should easily last a lifetime. My oriental wife has ruined many a nice kitchen knife, using them to hack thru bones, gristle, and tough meat. This one, however, will definitely stand up to any abuse she might put it through. Not just a meat cleaver, but also a super hunting knife - not too long, well-balanced, and "ouch" verrryyy sharp!!! I love it, and will definitely buy another one (or two). I gave this item as a gift. The person that got it, was very happy with the construction and quality. like the looks, but one for my brothers too. It was bigger than I thought it would be. I LOVE THIS MACHETE!! it's nice and Texas has a open carry law and this will be my tester. 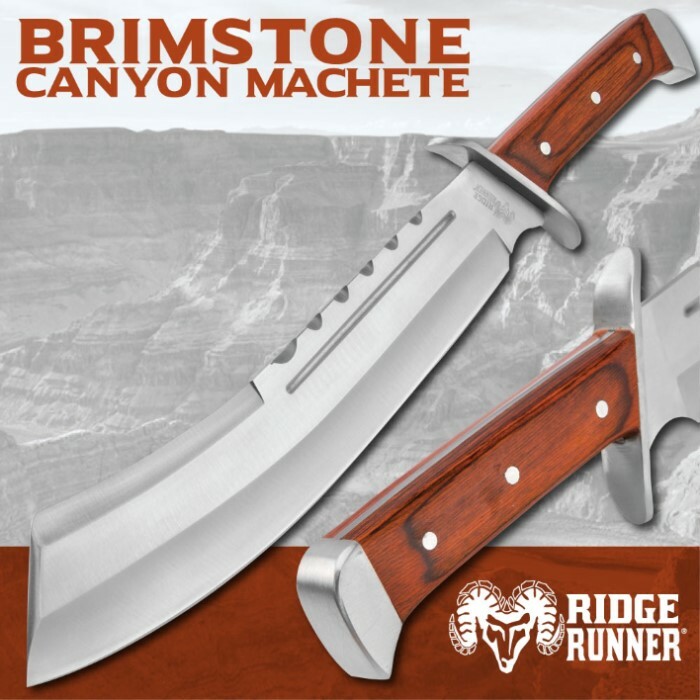 Just received the Brimstone Canyon Machete and It's very nice. Now if I don't use it for an axe,like some people have done,I believe it'll last for a long time.